Top voices in historical fiction deliver an unforgettable collection of short stories set in the aftermath of World War I—featuring bestselling authors such as Hazel Gaynor, Jennifer Robson, Beatriz Williams, and Lauren Willig and edited by Heather Webb. On the eleventh hour of the eleventh day of the eleventh month... November 11, 1918. After four long, dark years of fighting, the Great War ends at last, and the world is forever changed. For soldiers, loved ones, and survivors the years ahead stretch with new promise, even as their hearts are marked by all those who have been lost. As families come back together, lovers reunite, and strangers take solace in each other, everyone has a story to tell. In this moving anthology, nine authors share stories of love, strength, and renewal as hope takes root in a fall of poppies. It's either the longing in your eyes or the name you gave your daughter, but something tells me you want to start a new life as much as I do. Exactly seven years ago, around about this time of day, she had met Daniel for the first time. Seven years, and they had been parted for nearly all that time. I shouldn't have made you promise not to write. I watch for the mail every day, on the chance that you forgot the promise or wrote despite it. I wish that I knew how you felt about all this. Because, as crazy as it is, as reckless as it sounds, I don't think I mind. I liked the dream I had last night. I wish you could've seen it. 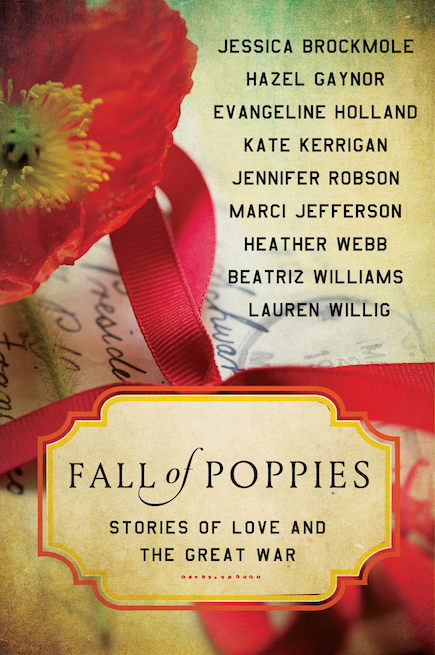 Fall of Poppies combine nine collective stories by nine amazing historical fiction authors into this great collection of literature. The stories focus on the time right when World War I was over. It portrays strong female protagonists that are all searching for something after the war ends. A place to feel safe, a loved one to call their own, a place in this new world. I just adored all these stories so much! A story of a woman that only hopes to get her grandmother's painting from her abandoned house. before she leaves the country that destroyed her family forever. This painting is all she has left to support herself and her daughter Hope when the war is over. Then her plans seem to be ruined when she is left to care for a German soldier she knows nothing about. This story was written by one of my favorite authors in historical fiction. I am addicted to the way Marci Jefferson portrays the woman in her stories. They are all strong regardless of their struggles. Daisy sits by her fathers death bed as she quietly waits to see her father at piece finally from the pneumonia that will take him to heaven. She has much to do once he has passed. This leads Daisy into her fathers study that she has never even thought about going. Once there she finds a letter that makes it appear that her father kept an important message from her. As Daisy searches for answers to her fathers betrayal, the reader is led to 1918 when Daisy volunteered for a woman who would make masks for the men that came home from war forever scarred by their fighting. This is when Daisy meets a man she can't seem to let go of. This was my first story from Jennifer Robson but it won't be for long. I am in the middle of reading her latest novel "Moonlight Over Paris." I am quickly falling in love with Jennifer's characters and the way she seamlessly captures the readers attentions with her unique style. A definite must read in this story collection. All these stories were really good. I felt drawn to each plot and was unable to stop reading until that particular story was done. Pick up this collection of war time stories if you are a historical fiction fan like myself. To win one of three copies of Fall of Poppies: Stories of Love and the Great War please enter the giveaway via the GLEAM form below. Rules – Giveaway ends at 11:59pm EST on March 11th. You must be 18 or older to enter. – Giveaway is open to US residents only. – Only one entry per household. – All giveaway entrants agree to be honest and not cheat the systems; any suspect of fraud is decided upon by blog/site owner and the sponsor, and entrants may be disqualified at our discretion – Winner has 48 hours to claim prize or new winner is chosen.